5am - Traffic going passed our Nite Camp became noisy. So, we headed over to 24 Hour Fitness in Temecula. Because of low heavy fog, we had to drive very slowly. Recently, Google directions to 24 Hour Fitness has taken us to strange places! Yesterday, to a neighborhood behind the shopping mall where 24 Hour is actually located. That time we Googled 24 Hour's address to get there. This morning, Google's directions to 24 Hour in Temecula, took us to a parking lot in the rear of the shopping mall! The Scampy Team is now camped in the parking lot close to 24 Hour. 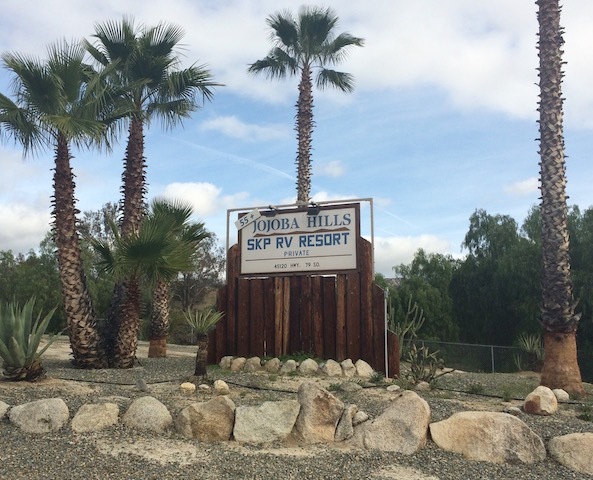 I'll workout at 24 Hour, then drive over to Jojoba Hills RV Park. We have been considering two sources of electric power. Solar and electric generator. We are leaning toward using only solar. The generator that we like is the Honda eu1000i, 1000 watt [link]. This generator would likely only be used during the dead of winter. For the rest of the year a solar source would do fine! 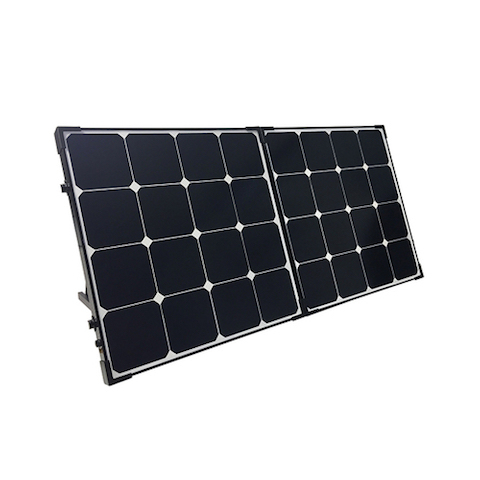 We really like the Renogy Solar Kit [link]. 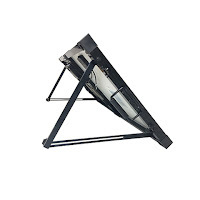 The Renogy kit is stored in its own case, which has a folded dimension of 21.1 x 21.5 x 3.1 inches. That's really small! And will fit into Little Honda's storage area nicely. The big electric hog for Scampy, is the Dometic refrigerator when on 12 volts DC. The fridge pulls 10.5 amps! That is a LOT! However, it is hardly ever necessary to use the Dometic fridge on 12 volts DC. The Dometic works fine on propane. The only thing is, that the propane flame blows out when Scampy is traveling down the road. So, let the propane flame blow out! The fridge stays cold for many hours when no cooling is going on. And, the Dometic recovers proper temperature extremely fast when we start up cooling at the end of a trip. All the rest of Scampy's electric usage amounts to less than 2-amps. That's when the 12 volts DC is inverted to 120 volts AC for charging the Mac Air and iPhone. Note: Our Dometic fridge is designed with three power sources. All manually actuated [not automatic]. Scampy's instructions read that when traveling, use 12 volts DC. Because when traveling using propane gas, the flame blows out because of wind. 12 noon - Where are we now? I'll be camping at Jojoba Hills RV Park for seven days. My days are usually very active. I love to be active! My time at Jojoba should be active too. The late afternoon is a really good time to use the Exercise Room followed by soaking in the spa. Other people seem to enjoy the spa at this time too. That's great because it is a good time talking with people living full time at Jojoba. I set up Scampy and left Baby Boid with the iPhone playing The Beatles, The Beach Boys and the Bee Gees. Boid enjoys rock music! Then headed over to the Exercise Room to workout. Google's funny sometimes. Mostly it's accurate, but the one time I'm pulling the Coach out in the middle of nowhere it takes me (or try's to) down a rabbit hole. So you have the same thing happen to you with Google's directions? Gotta love it though! Quite frankly, George, I don't see why you need any other energy source except Scampy's battery and the Honda's alternator. You don't have to worry much about Dometic's flame going out when you're on the road, since the door isn't being opened and temperature will maintain for many hours. If the remaining draw on the battery is just a few amps occasional when you're using your electronics, that shouldn't take much more that 10 amp/hours a day out of the battery, providing you with many days of use. If the charging connection to the Honda is right, your normal daily driving should easily recharge the battery. If it doesn't, somethings wrong with the hookup. I think the size of your tanks will be the limiting factor for how long you can stay in one place. 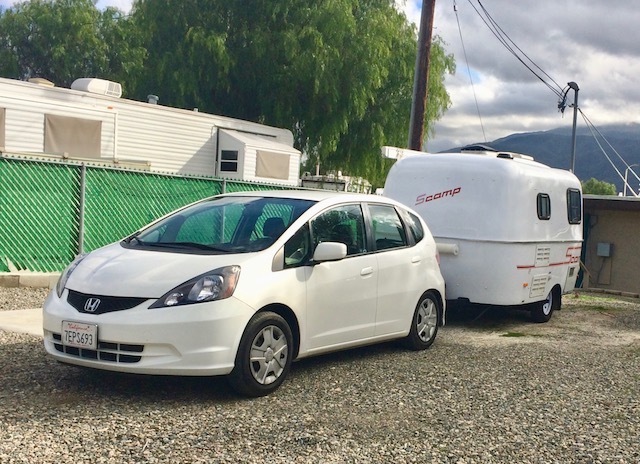 Even so, if the battery needs charging, just start Ms Honda Fit. You can run her for a long time before spending the thousand or so a genny is going to cost. Also, I believe the reason the Scamp battery didn't charge properly from the Fit could be that 10A Domestic draw and the voltage drop it caused in the wiring. You have listed some good points in your comment. And you are theoretically right! However, with that said, my experiences have taught me there are more things to consider. Example #1: Let's say that Scampy is boondocking out in the forest. Gonna remain out there for a month. Hardly driving at all. Example #2: Again, we are out there boondocking. Hardly driving. Rain comes. Clouds. Not much Sun for a couple of weeks. No generator. Solar no good in that weather. PS: FYI, I do not plan on buying an electric generator. I have already purchased a solar kit. "I think the size of your tanks will be the limiting factor for how long you can stay in one place." I believe that your tanks refers to Scampy's fresh water tank. Scampy has a 12 gallon fresh water tank. For boondocking, when refilling may not be available, we may stock up with 5-gallon fresh water bottles. Our 12-gallon fresh water tank goes empty in 4-days. This means that, for example, when going on a two week boondock, we would require (5) 5-gallon bottles be stored in Little Honda's storage area. By "Honda's alternator", I meant the car. Wish we had a three-way fridge. I miss our old rvs. They all had them. With solar and the smaller fridge you'd be surprised how often you can just keep it on 12V. At night the usage of the 12V fridge drops considerably. Enjoy it. This is the very first 3-way fridge that I have ever used. $$$ for the Honda EU1000 generator is worth every penny. First it is likely one of the best generators money can buy but more importantly when you are boon docking having power readily at hand is often more then a luxury -- it can be paramount and a basic need. I agree with your comment about the Honda eu1000i generator. However, I decided not to buy the Honda at this time. I prefer to wait and prove to myself that the need exists. My future camping experiences with Scampy will show me if I need the Honda 1000 watt, or not.